Movie Review: Allow me to start with a fair warning: whoever goes to the theater to watch Josh Mond’s “James White” assuredly won’t have a joyful experience. The film’s agonizing plot, mostly set in New York, was well imagined by the debutant Mr. Mond, whose handheld camera closely follows the empty look of the title character (Christopher Abbott), a miserable slacker who, after another night soaked in alcohol and acid, arrives at his mother’s home in the morning to mourn the death of his estranged, long gone father. James’ fragile mother, Gail (Cynthia Nixon), soon finds out that her cancer has spread, turning into stage four, which anticipates that death might be on its way sooner than expected. This sad news comes when the jobless James and his best friend, Nick (the rapper Kid Cudi), regular presences in the wild nightlife, are in Mexico having fun. This trip was supposed to provide a relaxed time, which would serve as a preparation for James’ changing for a new life: organizing himself, keeping away from his vicious addictions, and later giving a shot on a job offered by the kind Ben (Ron Livingston), an old friend of the family. Despite his intentions, James was never close to keep his promises, because seeing his beloved mother dying little by little, pushes him harder to the abyss of despair and discontentment. Not even Jayne (Makenzie Leigh), a young New Yorker he has met in Mexico, is capable of giving him the solace he needs. It’s an emotional downward spiral that’s clearly excruciating to the character, but no less to the viewer either, since we can actually sense the miserable states that crush mother and son. The anxiety discharged by Abbot and Nixon’s performances is compelling enough to achieve this substantial exchange of complex feelings and tough moods. Despite the difficulties coping with the situation, James takes care of his mother with extreme devotion and not for once abandons her in his mind. Even when he feels the necessity to go outside to breathe fresh air, his mom remains very present. Mr. Mond, who produced Sean Durkin’s “Martha Marcy May Marlene” and Antonio Campos’ “Simon Killer”, sees these two directors repaying him by co-producing this pungent drama that avoids giving hints about James’ future. 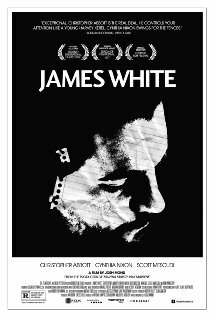 The film’s conclusion leaves us in a perpetual curiosity and we leave the theater with nothing but four hellish months in the thorny life of a certain James White.